The Economical Way to Protect the Environment. Contractor and Industry Shortcuts will cost us dearly for years to come! The environmental laws are not being equitably enforced. Sand and coal slag blasting is still the accepted practice in many structural steel repainting operations throughout the United States under the trumped up excuse that open blasting with dusty one use abrasive is necessary to remain competitive. Virtually all states still tolerate open blasting. State and Federal authorities still have not mandated total containment or the use of recyclable non-dusting metallic abrasives for blast cleaning in spite of proven environmental and economic advantages to recyclable metallic abrasives. The State of California is reputed to be tough on environmental issues, yet it has a mandated procedure that unwittingly approves dusty, mineral abrasive which often contains excessive quantities of restricted elements under the so called "Qualified Products List" (QPL) for open blast cleaning! Require use of recyclable iron or steel grit. Ban all open abrasive blasting. Blast debris containing lead-based paint should always be handled as hazardous waste. These wastes shall be taken to a beneficial reuse facility such as a lead smelter. Disposition of waste shall be the joint responsibility of the facility owner and the contractor. Steel structure owners should: Protect the environment (minimize liability), provide safer working conditions for employees, preserve the structure, and complete the work in a cost effective manner. One use abrasive encourages environmental cheating! There is no economic incentive to prevent loss of blast waste debris from release to the river or land below the structure. It is wrong of the DOT to reimburse the contractor for disposal as an ADD item because there is no incentive for the contractor to minimize the generation of waste. If the contractor is required to include disposal cost in his bid - he will want to use a recyclable product. The economics of recyclable metallic grit dictate a tight containment system because the abrasive costs $400 per ton compared to the cost of recovery of about $30 per ton. The Resource Conservation and Recovery Act (RCRA) mandates minimization of waste. Wherever practical Government and Industry must utilize technology which minimizes generation of hazardous waste. Generators of hazardous waste have responsibility and liability-CRADLE TO GRAVE. Masking agents added to one use mineral abrasive media do not eliminate the risk. The waste may pass the TCLP but the heavy metals remain along with the liability. Abrasive blast cleaning with recyclable metallic abrasives reduces the generation of hazardous waste by 98%. Only ferrous abrasive blasting waste can be processed into a source of lead for automobile batteries (no risk alternative). Recycling lead waste into batteries or other beneficial products converts waste to a resource. Abrasive blasting using non-recyclable coal slag results in suffocating dust and thousands of tons of worthless, potentially hazardous blast debris. This hazardous debris must be recovered and then wasted, filling up scarce landfill space. Recyclable metallic abrasive cleans faster then coal slag. Virtually no dust is generated and the metallic abrasive can be recovered and cleaned using automated blast recycling equipment for countless reuses. While garnet can be reused three to five times, each additional use reduces productivity. Plus, garnet blasting creates a lot of dust. It is very expensive and waste recovery and disposal remains an issue. Why fill our scarce landfills with unnecessary blast waste and cause thousands of unnecessary trucks on the highways? Water jetting only removes the paint. The mill scale remains and the rust will return before the paint can be applied. The equipment for water jetting is extremely expensive and productivity is poor. Water jetting creates a disposal problem with thousands of gallons of contaminated water. Metallic abrasive blast cleaning is twice as fast as water jetting. It removes the mill scale and imparts a profile in one step. Water jetting does neither. Overcoating, or encapsulation of old lead-based paint, is bad science. Adding more paint that has a short life will only contribute to the amount of hazardous waste that must be removed later. In addition, there is the risk that structural defects will be covered over, leading to catastrophic failure of the structure. Overcoating is not lead abatement. It is a high cost, deferred maintenance program that creates additional hazardous waste and passes added costs to future administrations. 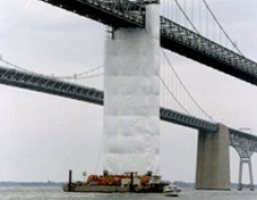 The Federal Government's Transportation Research Board (TRB) survey of 36 agencies involved in 4136 bridge rehabilitation projects proves that overcoating failed. Overcoating systems are more costly than total removal. Total removal of rust, mill scale, and paint is the acknowledged good painting practice for dealing with lead based paint on bridges.